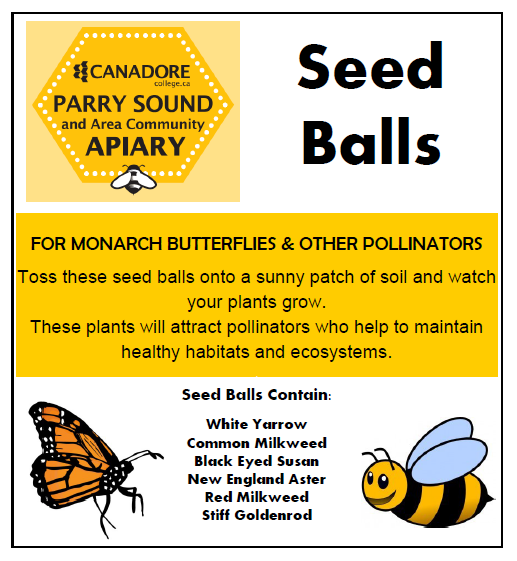 This week four classes from Parry Sound Public School and Nobel Public School made seed bombs to contribute to Canadore’s Monarch Butterflies and Mason Bees Workshop. On Saturday, March 25, Canadore College’s West Parry Sound Campus will be hosting the workshop, funded by a grant from TD Friends of the Environment. In this free workshop, fifty participants will learn about pollinators, mason bees and monarch butterflies. Thanks to the students from area public schools, workshop participants will get to take home seed balls. Seed balls are about the size of a gumball and consistent of soil, clay and native wildflower seeds. The seed balls can be placed anywhere and are activated when it rains. The seeds will grow plants that attract pollinators who help to maintain healthy habitats and ecosystems. Students from the public schools are making hundreds of seed balls to distribute to workshop participants, and some to keep for themselves. Some of these students are visiting the Parry Sound & Area Community Apiary at West Parry Sound Campus in the Spring to continue to learn about the importance of pollinators.